It's a merrier and jollier Christmas as Jollibee celebrated Jolly Jolly Joy Joy Christmas Special with Popstar Royalty and Jollibee brand ambassador, Sarah Geronimo, held at the Trinoma Activity Center last December 14. 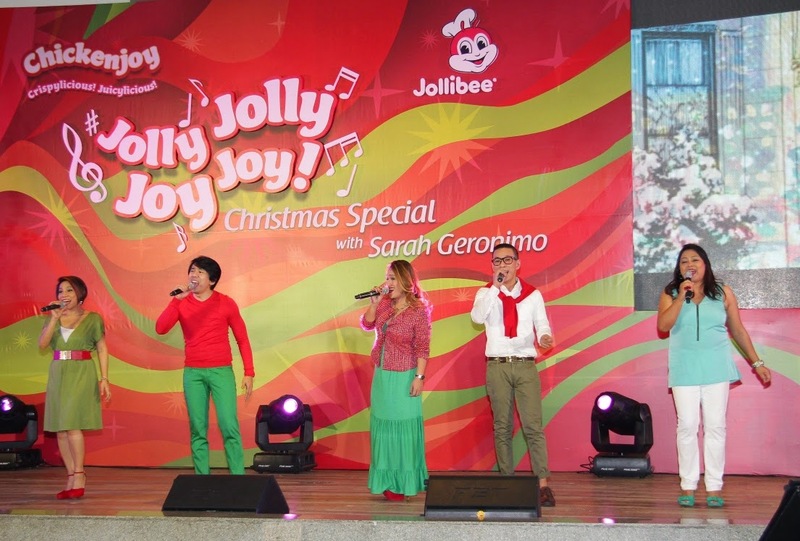 Everyone was in a Christmas mood as Jollibee lovers of all ages were treated to a grand musical holiday as the leading fast-food chain celebrated the harmony of the holiday season in the Jolly Jolly Joy Joy Christmas Special with Sarah Geronimo. 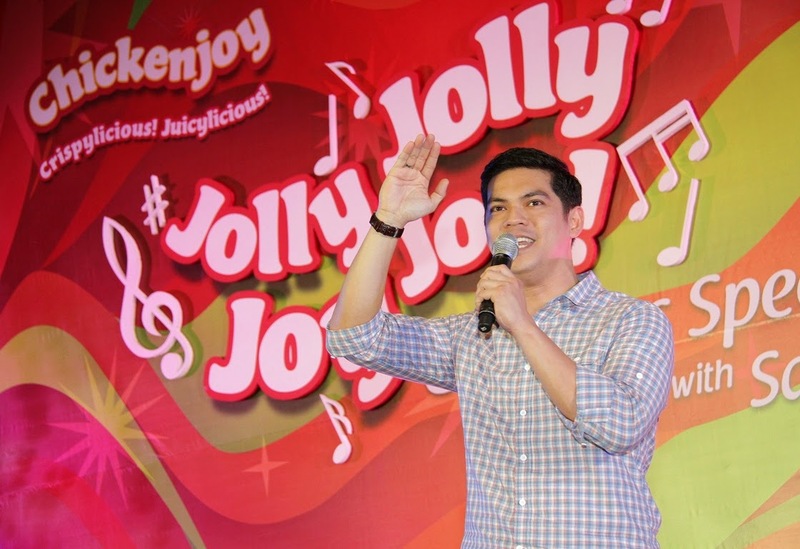 The Christmas spirit was definitely in the air as the Pop Star Royalty and long-time Chickenjoy ambassador led the festivities, and shared Christmas joy through her heartwarming rendition of well-loved holiday carols and the new Jollibee theme song, “Jolly Jolly Joy Joy.” I seriously love the the Jolly Jolly Joy Joy jingle because it is upbeat, the lyrics are quite catchy and it gives me the LSS thingy at the end of the day. 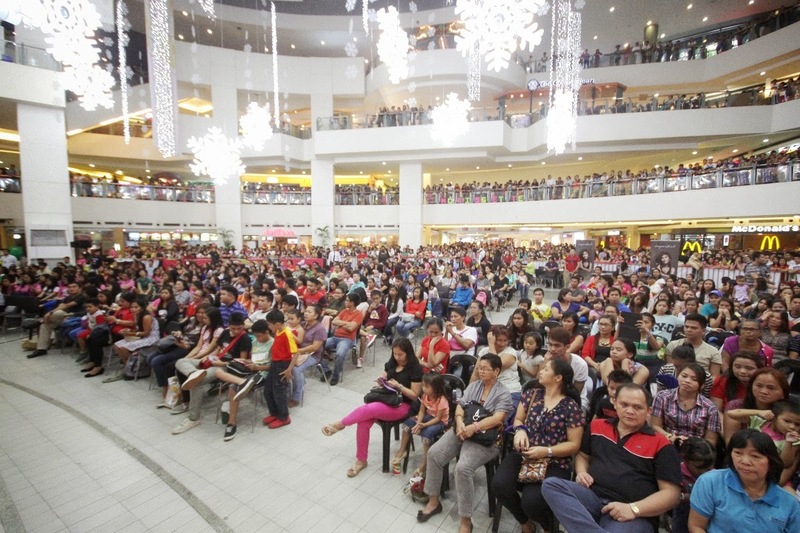 Take a peek at the huge crowd of Popsters who trooped to the Trinoma Activity Center for the Jolly Jolly Joy Joy Special. She also serenaded the crowd with songs from her newest album. The event was hosted by Justin and Riki Flores and they kept the crowd entertained during the musical event. 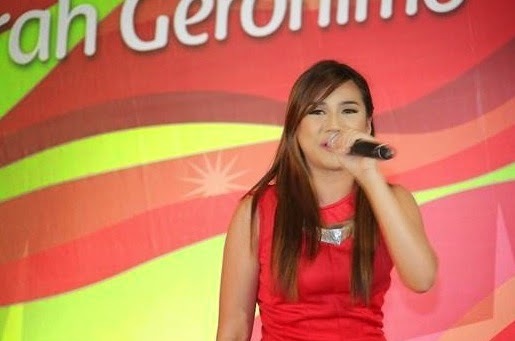 The musical celebration also featured performances by today’s most incredible talents such as The Voice of the Philippines finalist Morissette Amon. One of the most loved and respected vocal ensembles in the Philippines, The Company also performed a series of their hits, much to the enjoyment of the crowd. 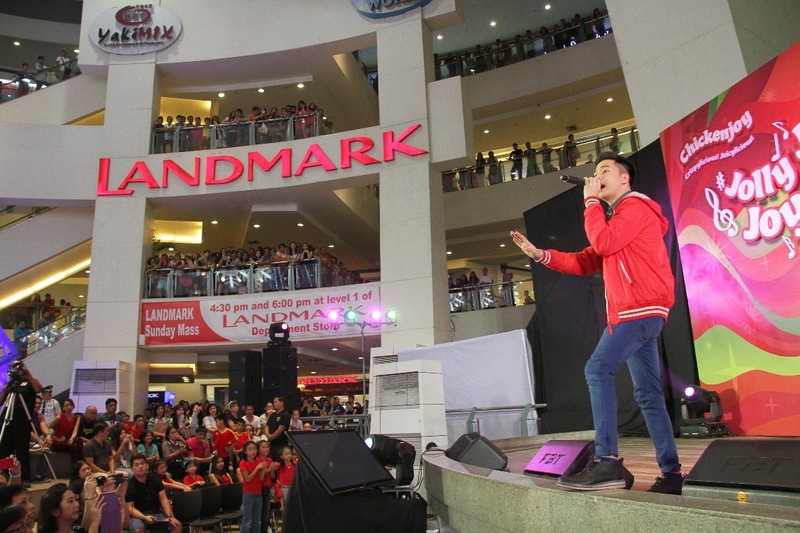 Singing heartthrob and former Yumbassador Sam Concepcion also kept the crowd on their feet with his energetic performance. I could not be any more grateful to Jollibee faor bringing that certain smile to my daughter and the hundreds of thousands of children across the country. I like the fact that Jollibee always have that genuine desire to make kids happy on Christmas time. They always try their best to influence more people to do more and share what they have and make kids happy this Christmas. No matter what these kids may be going through in life, a kid’s face lights up whenever you give them a toy. That is why I'm giving away a Jollibee Limited edition doll to spread the love this Christmas season. Also, don't forget to join my Instax camera giveaway here, Have a jolly, merry Christmas everyone! Bawat taon nakakagalak sa pakiramdam na maging kasama ka sa ganitong pagbibigay! my daughter love jollibee so much,hopint to win! I should teach my son to share his toys by donating some to Jollibee Maaga ang Pasko. Thanks for the giveaway and advance Merry Christmas! Thanks for running this awesome contest! My toddler loves Jollibee. Maaga ang Pasko is a best avenue to teach my daughter the spirit of giving and sharing. Laking Jolibee ako,. i'll make sure na magiging laking Jolibee din ang baby ko,. I super love jollibee and my kids too.. Merry Christmas to all. The best talaga ang Jollibee sa pagpapasaya ng mga bata. bata pa lang ako, jollibee na talaga favorite ko sa lahat ng fast food chain! Love it! hope to win! A lot of kids will surely be happy this Christmas, thanks to Jollibee. i love Jollibee because of its yearly Maagang Pamasko where they get to share blessing to less fortunate ones. Magaang sa pakiramdam na nagpapasaya ka ng mga bata! Thanks for a chance to win for our kids! every Christmas, nagdodonate ako ng toys,. What an Awesome Giveaway of Yours r0ckstarm0mma ... hope to win !!! ano kaya meron kay Jollibee ?! Thanks Jollibee, this has been a long running gift giving campaign and I am sure a lot of kids benefited from it. Keep it up and continue making the kids happy every year. Yun oh... yung the voice kids pala ang mga bata sa picture hehehe... thank you Jollibee for hosting this!!! Giving books and toys to Jollibee's "Maaga ang Pasko" has been a tradition for years! I am one of your most avid follower. And I always join, every time you have a giveaway but so far I never win pa, even once. But I never loose hope and keep trying my luck. My daughter will surely love this Jollibee Dancing doll. Hope to get lucky this time. God Bless & more power po. Lets continue sharing our blessings not just during holidays but everyday. It doesn't matter how much you share or what you particularly give but as long as its from your heart. I'm sure every thing will be very much appreciated by person you are sharing it to. Salamat at May Jollibee na nagpapasaya especially sa mga Bata! Sa Jollibee Bida ang Saya! Thank you for sharing your Love to others .. May the Lord continue to bless you abundantly! Christmas is really a season of giving :) Thank you Jolibee for this! Wow! Thank you and hope to win for my 2yrs old daughter..
hoping to win for my daughter! hoping to win for my son..
My daughter Gilliane loves Jollibee so much, at 2yo she's never been afraid of Jollibee mascot and she even hugs and run after Jollibee to see and hold him. I hope to win this my daughter will surely be happy. My son Really Favorite Jollibee! I've Been waiting for this kind of Giveaway! Hope to win this. Thank you. Whoah! Nice blog, I love this dancing Jollibee, hope to win this for my little niece. My son loves to dine at Jollibee when he was a child. Almost every week to thrice a week he ate there. Sana po manalo ako for sure may baby would be happy sa dancing doll with jollibee treat pa.awesome!!! hope to win this Dancing doll for my baby,. I love to win this Jollibee Dancing Doll for my niece on her 1st birthday. Bata pa ako Jollibee na ang favorite kong foodies. I love chicken joy and ngayon may anak na ako, favorite din nila ang Jollibee at mga collectibles toys dito. Hope to win for my daughters. I love to win Jollibee Dancing Doll for my baby bunso. My children have grown up loving Jollibee. Thanks for your company JOLLIBEE. That is a cute jollibee doll. You are blest because you are generous. thanks for sharing your blessings! Thanks for this giveaway. I really hope to win so that I can give it to my baby who has a chicken pox. I love this Jollibee Dancing doll. Hope to get lucky this time. God Bless & more power! We Love Jollibee! Thanks for this nice giveaway! more power and God bless you! My child loves Jollibee! Thanks for this giveaway. God Bless you and Maia. we love jollibee. we always attend their wrokshop. My family is a big fan of jollibee most especially their superb fried chickenjoy. If I win this giveaway, i'll share it to my younger cousins or neighbors to make them happy. We are always home at Jollibee even if my two boy are gentles now! Thank you po Mam. How can i claim my prize?